Nobody wants to think about their roof, but everyone wants to know that it will be there to protect their home and family against the elements. That’s what makes Crown Roofing the leading choice among roofers in Surrey. Over 100 years of experience and proven success means you can trust us to do the job right. Crown Roofing & Drainage offers both roof repair services and the design and installation of new roofing systems, along with eaves to ensure proper drainage in Surrey’s wet environment. Our expert installation teams use the latest roofing “best practices” on every roof to make sure it will deliver years of reliable service. 1. Quality Materials – We use only brand name roofing products and materials from the industry’s leading manufacturers, including GAF Corporation and Owens Corning. 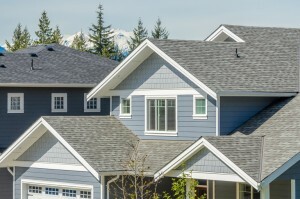 This approach ensures that your roof will stand up to the weather, year after year. 2. Exceptional Service – We take the mystery out of roofing by providing open and honest communication, clearly written estimates and schedules, and safe, efficient work. We can complete most roofing projects in just one day! 3. Guaranteed Satisfaction – Because Crown Roofing is certified by the manufacturers whose products we install we can offer you the industry’s best roofing warranties, along with our own guarantee of workmanship quality. 4. Proven Support – We’ve been roofing Surrey homes since 1902, and you don’t stay in business that long without proving your value to thousands of customers!